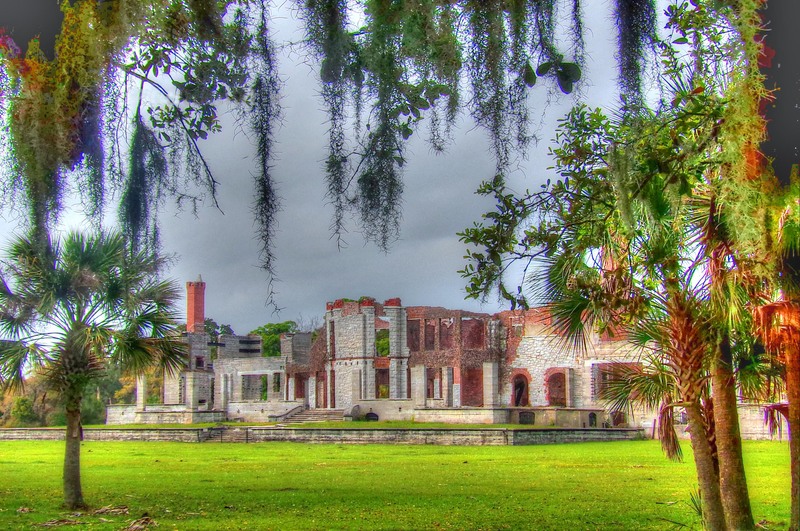 In the 1880’s, Pittsburgh steel magnate Thomas Carnegie and his wife Lucy bought the majority of Cumberland Island, the largest barrier island along Georgia’s ragged coastline, from descendants of Revolutionary War General Nathaniel Greene. Within five years they constructed a magnificent palatial mansion on the spot where the Greene family had built their own grand residence, and called it “Dungeness”, after the original Greene house. Thomas was born in Scotland, so the name was appropriate. In 1886, the house welcomed its first occupants, which included the nine children of Thomas and Lucy, and the many servants that were required to run a property that large. Sadly, Thomas Carnegie died just two years after completing Dungeness. The Carnegies came south every October, by sea, and remained in residence until April. At least one Carnegie daughter was married at Dungeness. Florence, called “Flossie” married Frederick Perkins in 1901. Remember, you can click on any image to see the full screen version. 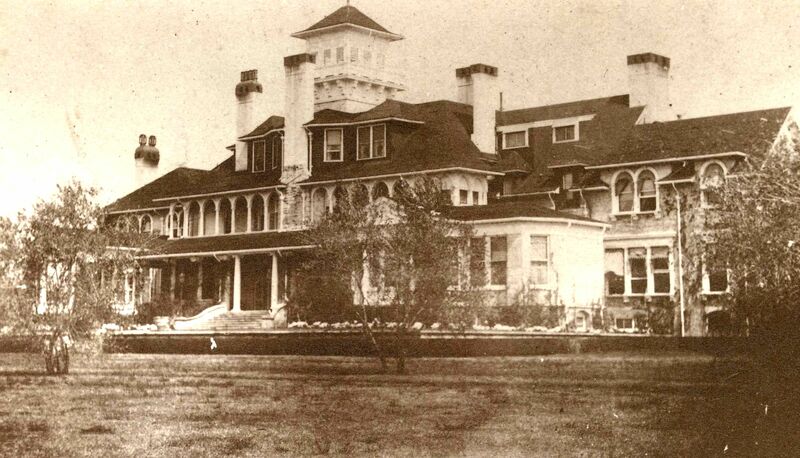 The family continued to winter at Dungeness, but in 1959, a suspicious fire tore through the mansion, leaving it in ruins, which is the way it appears today. 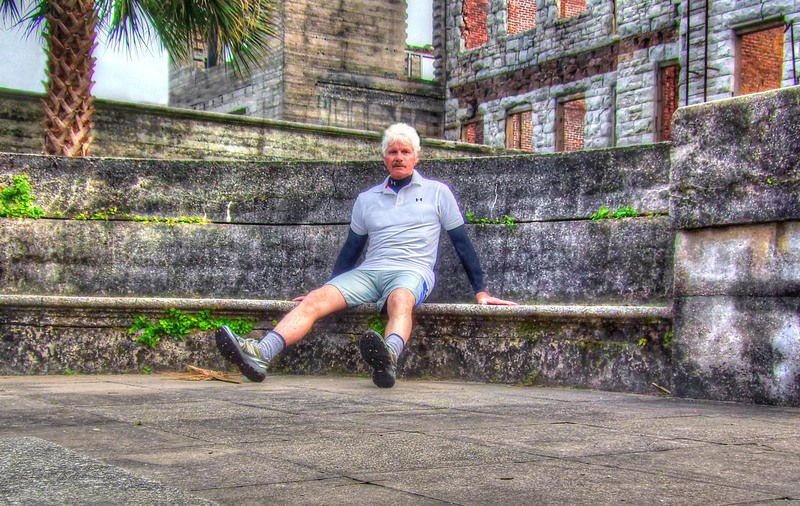 I made this photograph, and the others in this post, while spending three days on Cumberland Island the first week of April. Below is the view from behind the ruins looking south across the salt marsh toward Florida. Here I am in front of what used to be a splendid architectural treasure. 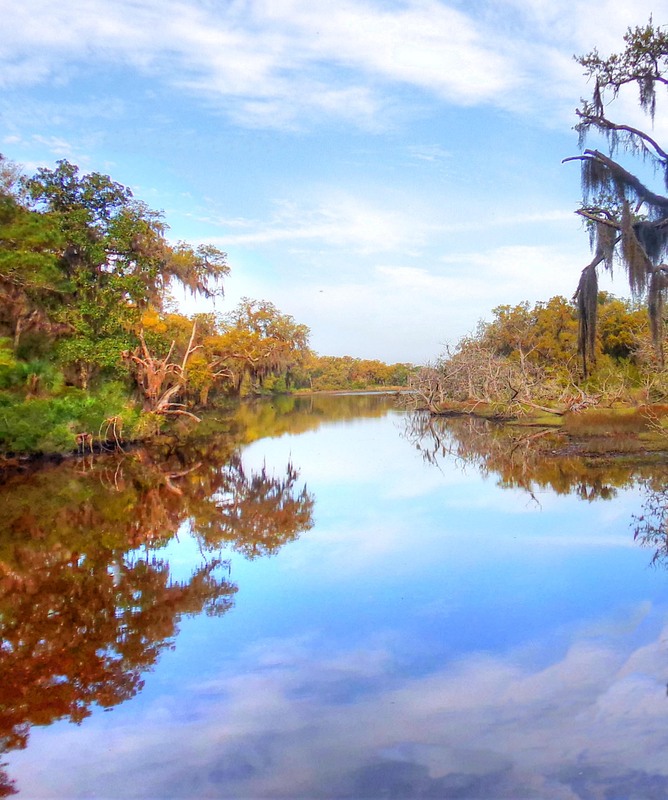 Cumberland Island is 18 miles long and three miles wide. It is only accessible by a 45 minute ferry ride. Only 300 visitors a day are permitted to disembark at one of four docks located on the western side of the island. 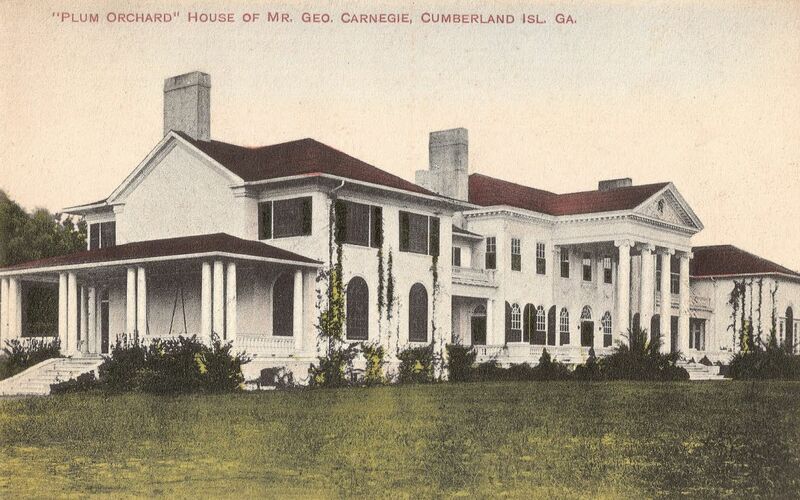 In 1972, the Carnegie family worked with the Federal government, who acquired the island, and established the Cumberland Island National Seashore. Descendants of Thomas and Lucy Carnegie were given lifetime permits to remain on the island, but all structures became part of the National Park Service. Many houses have been allowed to rot and collapse, but two mansions remain as viable legacies to America’s Gilded Age. The largest of the two was built in 1898 by Lucy Carnegie, and given to her son, George, and his bride, Margaret, as a wedding present, if you can call a 106 room, 22,000 sq. ft. house a wedding present. This Georgian Revival “Cottage” was designed by the same architectural firm that designed many of the large estates at Newport, Rhode Island. It was completed just three years after George Vanderbilt finished his Biltmore Estate in Asheville, North Carolina, and had the obligatory tiled heated indoor pool, and a full indoor squash court. Tiffany fixtures hung in the house, while hand printed silk and canvass wallpaper was featured throughout the residence. When George died, the house went to his younger sister, Nancy, whose family wintered there for many years. The house was allowed to fall into disrepair, and only recently did the park service find the funds to rehabilitate this dowager so the public could enjoy its grandeur. Once again the parquet floors, Tiffany chandeliers, and walnut paneled rooms is welcoming visitors. 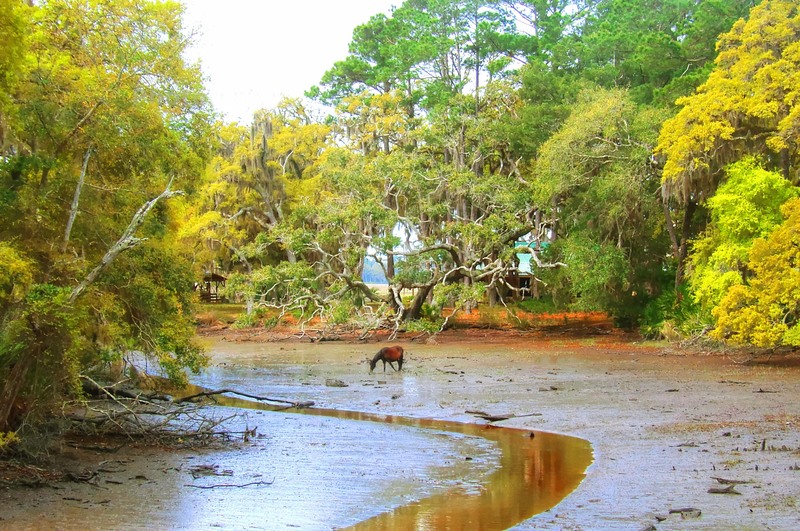 The sprawling house seems so out of place in this coastal forest wilderness area of Live Oak, Cabbage Palm, and Saw Palmetto. Tours are very limited, and advance reservations are a must. The main entrance hall features a Tiffany lamp that hangs above the original table that is original to be house. Sparse furnishings, mostly collected from pieces that once were at Dungeness, give the spaces a Spartan look, but it’s the house, itself , that is the star. Original canvas wallpaper covers most walls, upstairs and down. 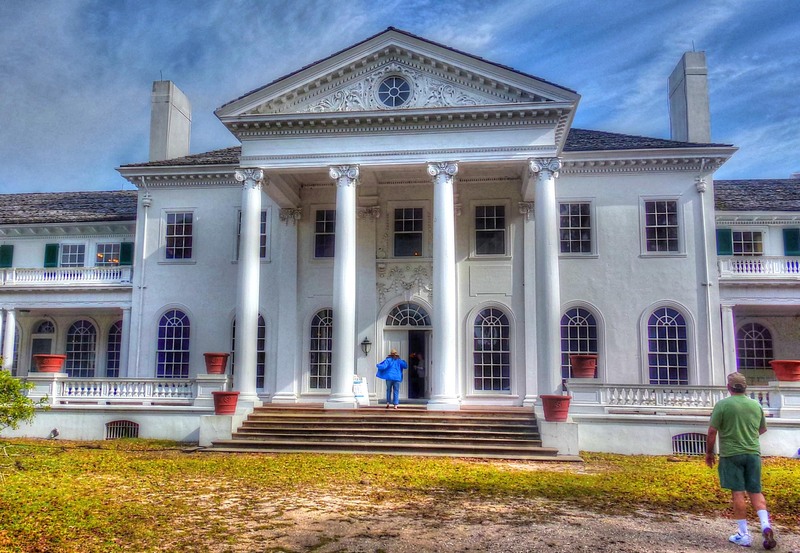 If you’ve had the pleasure of visiting historic Drayton Hall near Charleston, you’ll know what I mean. At the end of the hall leading to the western side of the first floor, you’ve find the Billiard or Game Room, with more Tiffany fixtures. A Baby Grand Piano sits at one end of the room, and I had the pleasure of playing it. The same pick-up truck that carried six of us to Plum Orchard Plantation on wooden side benches in the back bed, then dove us north along the only road on the island, a single lane dirt path, to see the place that draws most visitors to this remote place, but along the 45 minute bumpy ride, we passed one of Cumberland’s famous wild horses, eating new chutes growing up through the tidal mud at low tide. Oral history says that the horses are descendants of Polo ponies that were released during the Depression when the old families could no longer provide for their welfare. Another story puts them on the island when the English were here in the 18th century. There is fresh water on the large island, like the lake shown below, and plenty of wide open grazing space. In 1996, John F. Kennedy. 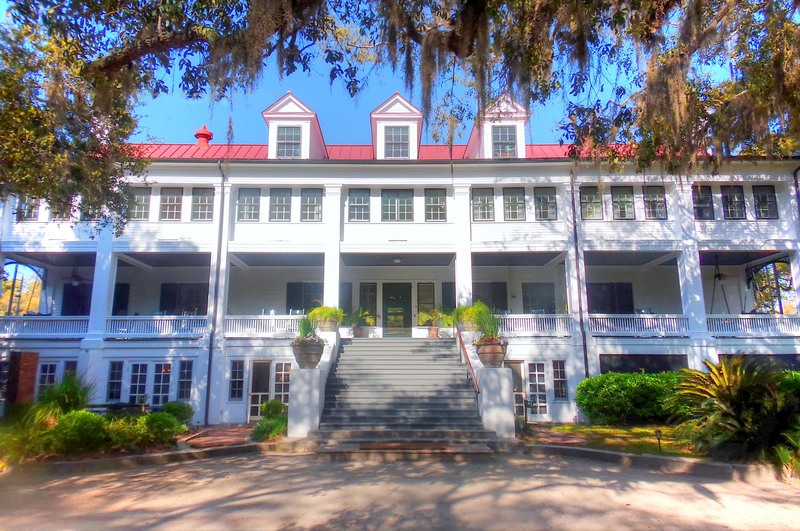 Jr. married Carolyn Bessette, and they chose Cumberland Island as the place they would be married because of the total privacy the island offered. A small vilage known only as The Settlement, was located at the far north end of the island. 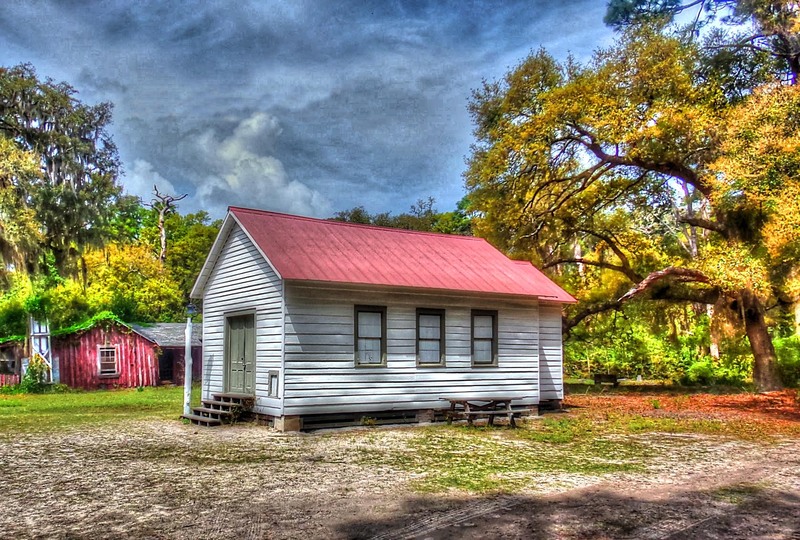 This is where people freed from slavery settled after the Civil War, and they built a small church, which also served as their school. It was in this simple structure that vows were exchanged, away from the prying cameras of the papparazzi. It is a very special place. A few handmade pews, and a small table for an altar served the Kennedys just fine. There was no electricity and no running water, but the sunset ceremony was beautiful and magical. You might be thinking, “Where did the wedding party stay in such a remote place?”, and that leads us to the last of the three Carnegie mansions. Instead of fighting the narrow path back to the south end of the island, our guide drove us east to the expansive beach that lines the eastern side of Cumberland. The pick-up drove twelve miles along the surf on this perfectly smooth natural roadway. Along the way we passed more of the wild horses that free-range on the island. 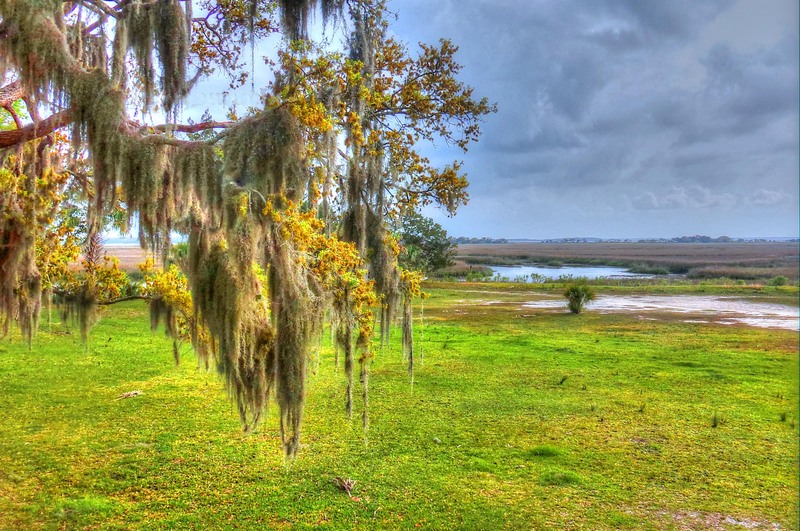 At the end of the drive we entered a tunnel of Spanish Moss draped Live Oaks that led us to the west side of the island, and brought us face to face with the Greyfield Inn, the place where the Kennedy wedding party had stayed 19 years ago. Greyfield, a colonial revival 15,000 sq. ft. house, was built in 1901 by Lucy Carnegie as a wedding present to her daughter Margaret when she married Oliver Ricketson. Margaret’s daughter, named Lucy after her grandmother, inherited the house, and lived there with her husband, Mr. Ferguson, and their children. Today, Lucy Ferguson’s grandson, Mitty, and his wife Mary, operate Greyfield as the island’s only hostelry, now called the Greyfield Inn. We stayed at the inn while we were on Cumberland. It was too small for the 50 person Kennedy wedding party, so Mitty and Mary parsed out beds in smaller private family cottages located near the inn. The priest stayed with them in their house. Mitty and Mary were the perfect hosts. A full staff of service people, like Alexander, who was our guide to Plum Orchard and the Kennedy Chapel, and a cadre of professional chefs who prepared full breakfasts and dinners, as well as a picnic lunches for the nearly 30 guests , made our stay so memorable. The food was out of this world good, as was the personal attention given by the staff. The expansive veranda along the second floor made the perfect place to relax with a favorite book or to nap in one of the swinging “Boat” beds at either end. The vistas across the meadow were magnificent. Bicycles were the mode of transportation around the island (I had riden to the beach and down to the Dungeness ruins.) There was no television and no telephones in the rooms (cellphones worked). While at Greyfield, you will feel like you have been transported to a much earlier time, and you will love it. Every afternoon, cocktails were available in a fully stocked “honor” bar next to the library. In addition to Victorian antiques, Chippendale pieces, and Tiffany lamps, there were hors d’oeuvres served in the Parlor. The library had many first editions from the Carnegie family, including a signed Rudyard Kipling printing. A bridal portrait of Margaret Carnegie Ricketson hangs in the parlor. 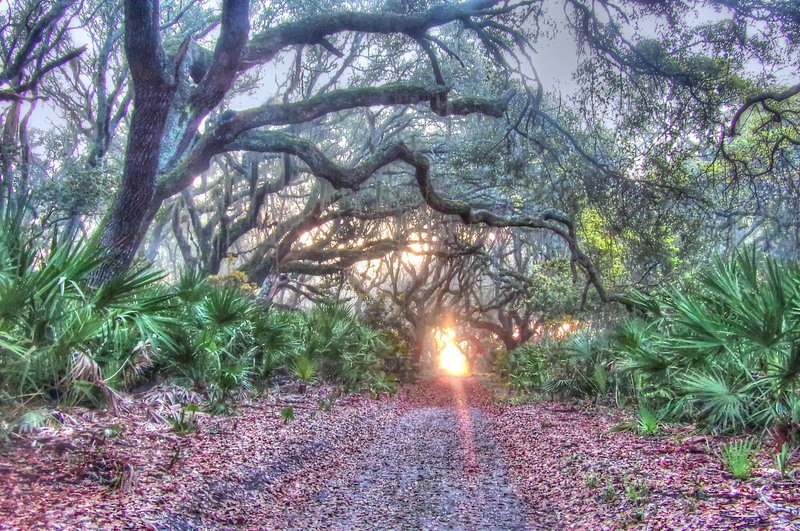 A sunrise walk to the beach under a canopy of ancient Live Oaks found the rising sun straight ahead. This alignment only happens a few days each year. It was the perfect way to end this tour of Cumberland Island and the remarkable Carnegie mansions that are scattered around this pristine natural setting. HOW I ENVY YOU, I DO APPRECIATE YOUR KEEPING ME ON YOUR E-MAIL LIST. Amazingly beautiful! From the natural to the man made, every photo shared told the story of “Time”. I do love the passage of time and the changes we can only witness from a historical prospective. From your pictures Vann we can spend a moment to reflect of that time.. Thank you for sharing..
What beautiful pictures, to get lost in. Thank you for posting. Vann, What a wonderful trip. Gorgeous pics. Would love to go sometime. A very enjoyable article containing info I didn’t know before. Well written about a fascinating place largely hidden to people. Thanks for sharing with us. Very interesting. Saturday we were at the island but didn’t step foot on it. Now we want to go and take the ferry and see some of the mansions.